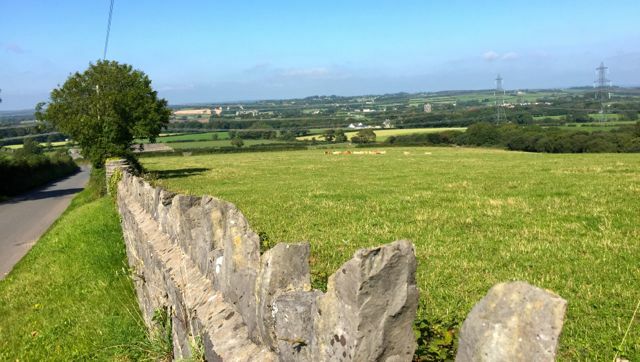 Despite being an area of outstanding natural beauty, with a large population living in historic villages dating back to the Domesday Book and basically being a bit of a mecca for almost every weekend cyclist who lives in Bristol, Keynsham, Somerset and Bath, the one thing that the Chew Valley lacked was a cycling club. I’ve been a member of Bristol South Cycling Club for years, enjoying their events and races in the Chew Valley. However I rarely attend their weekend club rides or social nights as these are all held in the distant lands of “the big city over the hill”. As a result I always felt that I missed out on a lot of the social aspect and camaraderie of being a club member. After meeting a few other Chew Valley cyclists who were struggling with the same problem we decided to start our own club. The club’s formation meeting was held at The Hunters Lodge, a lonely and slightly derelict-looking pub out in the middle of the Mendip Hills. The inside is magical: it’s like stepping into a time machine to a 1950’s pub. The place must have drifted through decades with the decor becoming increasingly dated and unfashionable. Fortunately the long-standing owners were clearly playing the long-game, knowing that one day it would just ooze vintage style! Either that or they just didn’t care. Anyway, not only does it work but there are several amusing myths surrounding the place. I’ve heard that the Kray Twins used it as a hideout, that tunnels beneath the pub lead to secret government bunkers and that if the owner catches you using a mobile phone he will either confiscate it or throw you out. Hence the lack of photos to verify the myth. I hope one day there will be a plaque outside stating “Chew Valley Cycling Club was formed here in 2016”. By the start of 2017 we’d formed a nucleus of new members, were holding regular club rides and had ordered kit. We played around with a few kit designs with everything looking like it had been designed by an idiot using ClipArt … basically because it had. So in the end we called in the experts and asked cycling kit supplier Milltag to design and make our kit. Probably one of our best decisions. The club has continued to grow which has been really enjoyable for everyone involved. We are affiliated with both British Cycling and Cycling Time Trials which has allowed several of our members to compete in road races, criteriums and time trials this year. However, the majority of our members currently just participate in the weekend club rides for the social and sporting aspect of riding in a group. 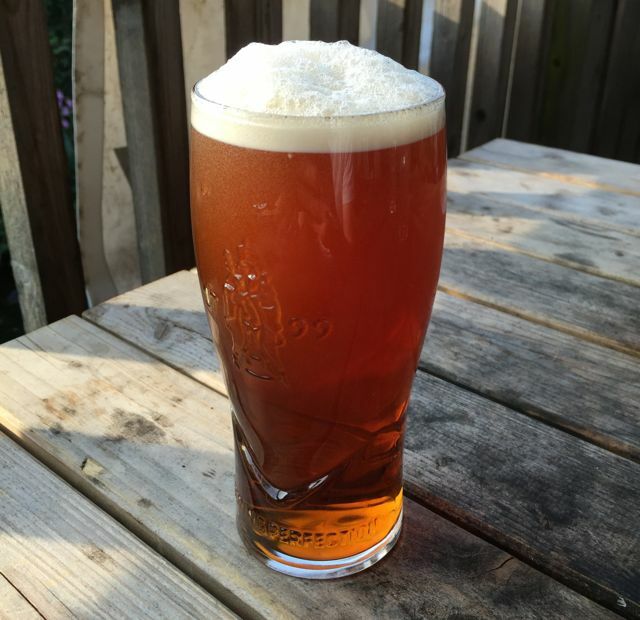 We recently held our first AGM (at The Hunters obviously) which was a great way to get feedback from our members and find out what everyone wanted from the club. Fortunately people mostly wanted more of the same, with the addition of beginner / introductory weekend rides for slower or new riders. So this is something we’re hoping to roll out soon. Oh yeah, and they wanted cycling caps, presumably for de rigeur cycling cafe stops! I’ve just returned from a two day saddlebag tour of the Brecon Beacons in Wales. A friend and I took a couple of days off work for a self-guided cycling mini-break. It was fairly impromptu and with minimal planning. 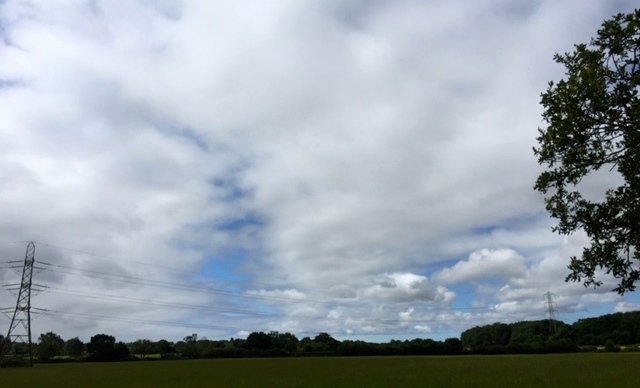 Unfortunately, the Audax Gods were clearly unimpressed by our slapdash approach to long-distance cycling and punished us with biblical downpours on Day 1. Any final hope of receiving retribution must have been dashed by the comment as we set off that “it never actually rains all day”. It did. We set off very early on Monday morning in a futile attempt to beat the rains. We took the most direct route to the Severn River crossing via Bristol. This meant fighting our way through rush hour, but despite the heavy rain and traffic it still felt quite liberating to be heading away from it all. I’d opted for my steel frame with pannier rack and bar bag. Mike went new school with his carbon bike and roll-bags attached with velcro and straps. There seems to be a movement towards the latter and I can understand the reasoning – you only need one bike and you can ride a lighter bike. However, if you’ve got a steely then this type of ride is the perfect excuse to rig it up in full tourer mode. Arriving at the hostel after 80+ miles in the rain was a great feeling. We immediately hung up our sodden kit, had hot showers and put on our sandals. Socks and flip-flops or bare-foot and birkenstocks? It’s always difficult to completely nail the audax haute couture style so I like to think we covered all bases between us. The 1970’s carpet definitely added to the effect. We had a beer, ate a hearty dinner and were both in bed by about 8pm. Not exactly rock n roll. We set off early the next morning and headed right up into the Brecon Beacons. The scenery was spectacular and made us wish we’d gone for 3 days to allow a full day of Brecon touring in the middle. We followed the River Usk down to Abergavenny with the sun in our faces and a strong wind on our backs. Combined with the long descent it felt like just rewards after the tough previous day. The conversation was free-flowing all day. It’s one of the pleasures of long distance cycling in remote parts – you can ride side-by-side at a relaxed pace and talk. And when the conversation dried up, the more immature member of the group resorted to childish pranks. In the end we covered 170 miles and around 10,000ft of climbing over the two days. It was one of those epic adventures that you wish you could do more often and will remember forever. Great times. For my birthday I gave myself the gift of zero responsibilities. This was mostly a gift from my wife who took care of business for the day while I skived off and went cycling. It wasn’t very “bikevcar”, but I decided to drive down to Exmoor for a long afternoon of cycling. 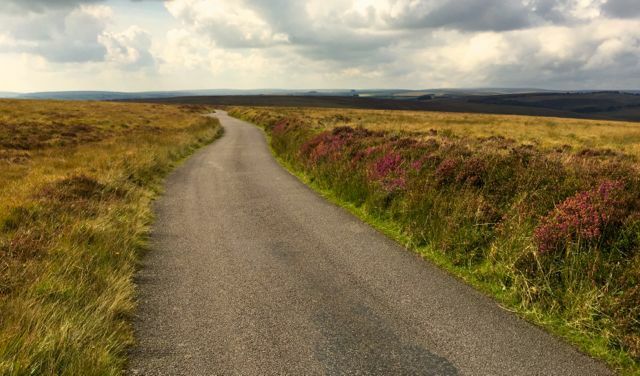 My previous cycling trips to Exmoor have been ‘sportives’, i.e. organised, mass-participation events. 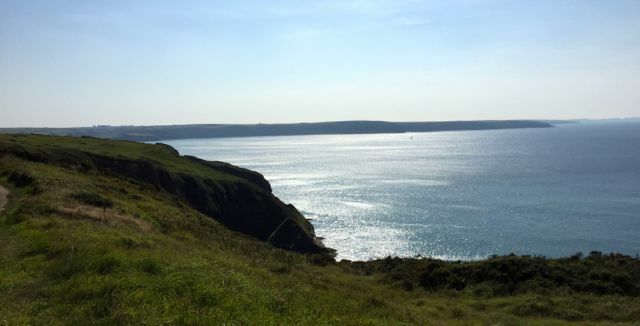 Today’s ride was the antithesis of a sportive – no early start because I do not like waking up early at the weekend, no other people because how can you enjoy the peaceful beauty of a national park when you’re surrounded by other cyclists, and no restrictions on my distance or route which was ideal as I hate being told what to do. It was perfect. I parked the car at a place called Watchet, mostly because the name made me laugh but also because I’d had enough of driving. And then got on my bike and climbed straight up into the moors. 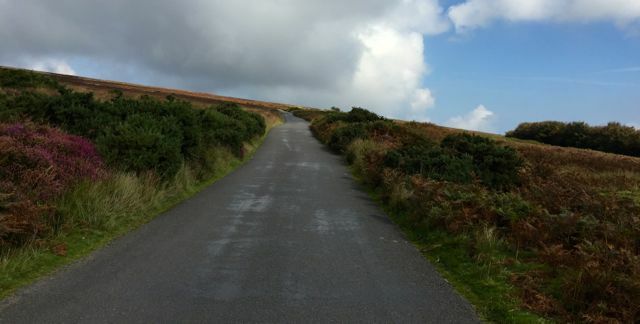 The roads around Exmoor can be bonkers-steep – a 20% gradient seems fairly standard for these parts. At one point I almost fell off when the road ramped up so suddenly that I was caught with my hands relaxed on the tops of the bars and didn’t have time to switch to the hoods so that I could stand up. Clearly my concentration and bike handling skills still need some work. 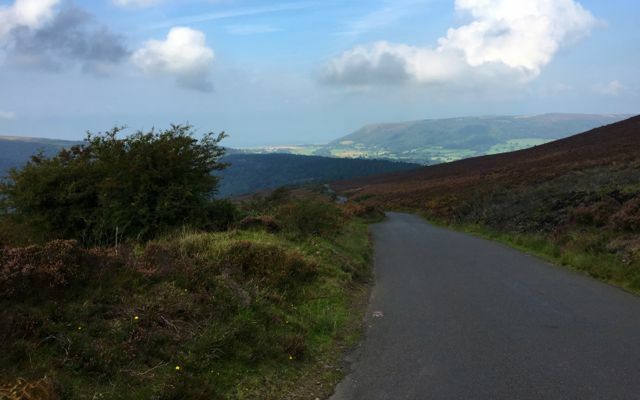 There were a few notable climbs that I’d wanted to find (Dunkery Beacon and the Porlock Toll Road) but other than that I had no aim. Just a photocopy of a road map to avoid getting lost and jersey pockets stuffed full of food to keep me going. In the end I managed 70 miles and around 6,500 feet of climbing. But it was just one of those days that I’ll remember for a long time. Exmoor in September in crisp, beautiful sun. 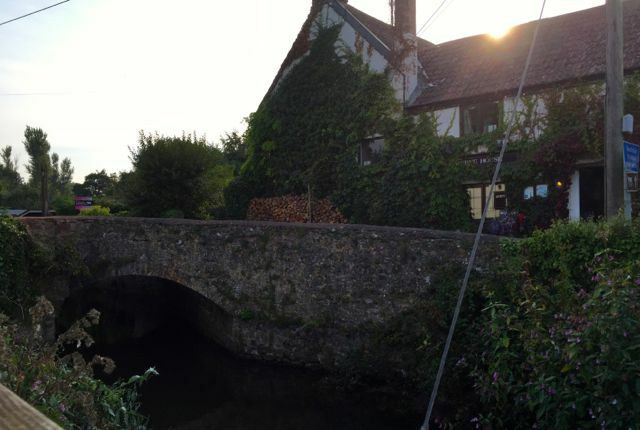 A glorious 5 hours on the bike followed by a pint of ale in a classic English pub garden beside a river. For a man who loves to moan, it’s fairly epic when I have a day with nothing to moan about! Whilst there’s been a significant drop in my cycling mileage over the last 2 years (and let’s not even mention the significant increase in car miles …. nor my very recent acquisition of a new “family car”), there has however been an enjoyable last few weeks watching a new cyclist arrive on the scene. 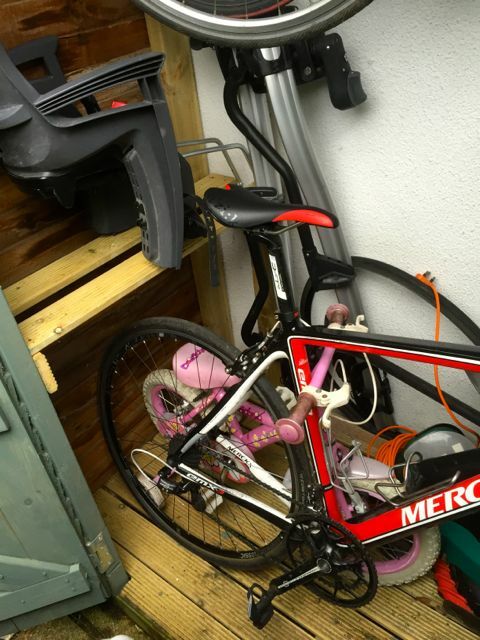 This has resulted in needing to make space in the shed for a new bike – obviously it was some superfluous gardening equipment that met the chop. I’ll gladly have a jungle for a back garden if it means I can still get out and cycle at the weekends. Anyway, holidays are a time to try new things. So Mum had time to relax. Little Miss showed off on a trike . . .
. . . and I found some time to squeeze in a few decent length rides. 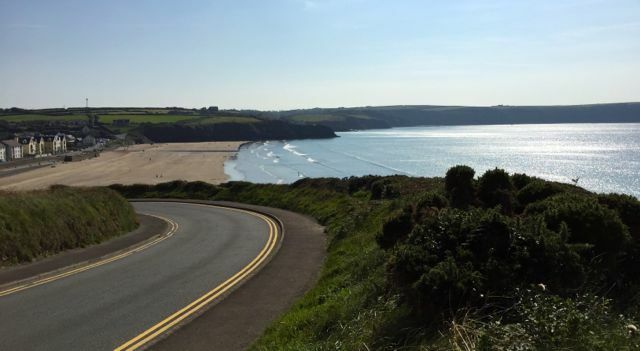 With beautiful weather, the coast of Pembrokeshire to explore and a toddler who requires an afternoon nap, I had a brainwave: one-way cycling. If we went out as a family for the morning I rode home. And if we were going out for the afternoon I set off after lunch and met them there. Even compared to Somerset and Southwest England, the roads were quiet. 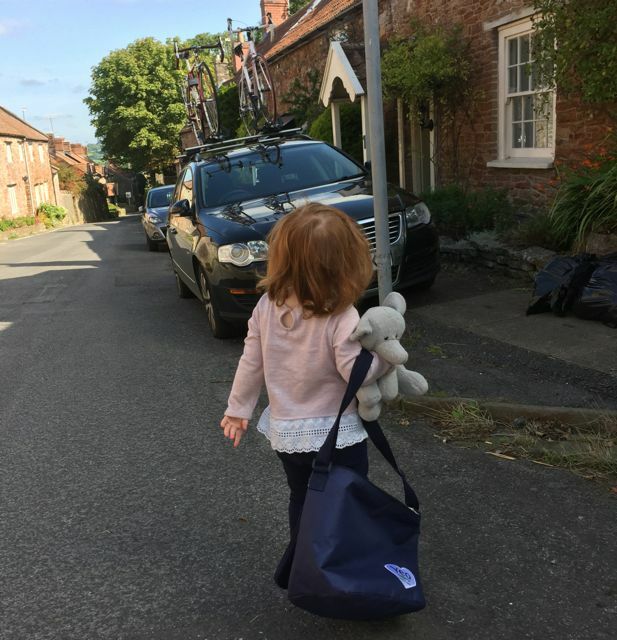 And the idea of one-way riding allowed me to squeeze in 100 miles of cycling over a weeklong family holiday without being too selfish. The coastal roads were stunning. Although the hills and the winds made for some challenging cycling too. I took the steel frame bike so that I could attach the baby seat for local rides. This added an extra element to the challenge. But, after all – it was a holiday so I mostly ignored my average speeds and just enjoyed the beautiful weather and the change of scenery. I decided late last night to ride the Avon Cycleway loop around Bristol today. Like some of the best and worst ideas I’ve had, this one was discovered somewhere near the bottom of a bottle of wine. I woke this morning without too much of a fuzzy head, ate breakfast twice before then preparing my bike. I had a completely free day to myself as well as a personal point to prove after my only other 100 mile ride this year resulted in being painfully towed and finally dropped by my fitter and faster mate. With my jersey pockets and stomach stuffed full of food I set off at around 9am heading towards Bath along narrow country lanes. The Avon Cycleway is an 85 mile loop around Bristol along quiet lanes and bike paths. Looking back this was one of the first long rides featured on this blog almost four years ago. One of the problems on long rides in unknown territories is refuelling. Especially on a Sunday with most shops shut. 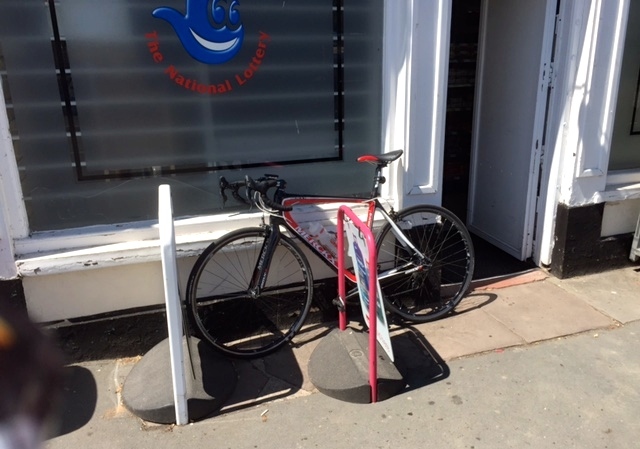 I ended up barricading my bike between two signs outside a little shop and checking on it several times. The thought of it being stolen miles from home was a hassle I could do without. Having successfully navigated around 70 miles of twists and turns, I got lost at the exact same point as last time. Somewhere in the Bermuda Triangle of Avonmouth the signs just seem to disappear. Fortunately I could see the looming Avon Bridge and headed in the right direction. 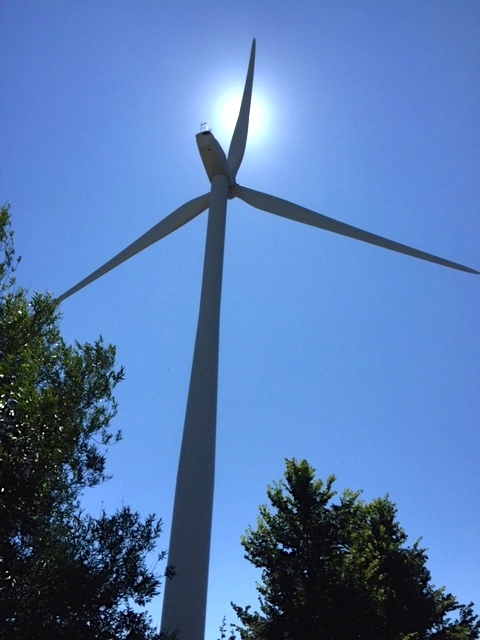 As with all 100 milers the final 20 miles were fairly tough, but the warm breeze of a welcome tailwind helped me home. I was just around the corner from home when I realised I was going to finish up on 96 or 97 miles. Putting fatigue aside I took a small detour to hit the magic 100. 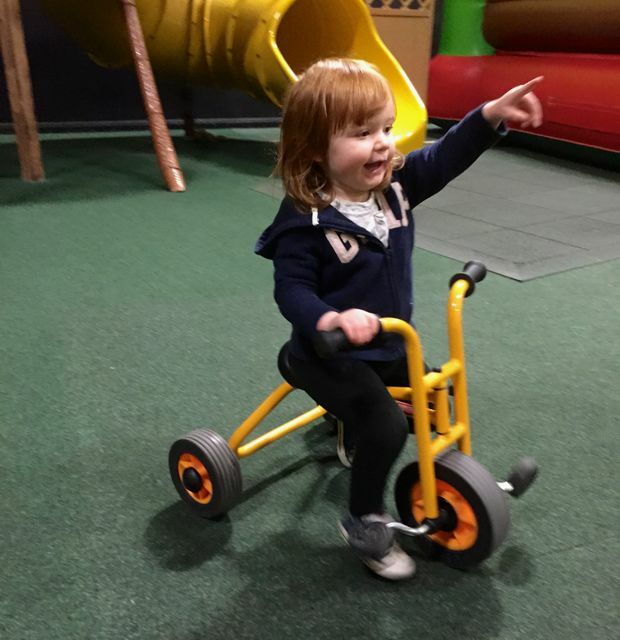 If you want to ride your bike on a regular basis, don’t have a child, start your own business or embark on a home refurbishment project. And especially don’t do them all at the same time. Only an idiot would do that. Anyway, this particular idiot has finally complete the refurb project and so took the opportunity to go for a long ride today. 70 miles to be precise. Continuing the theme of biting off more than I can chew, I’ve signed up to do a 100 mile sportive in a couple of weeks time with an old mate so thought I’d better condition my bum to endless hours on a saddle. I’m generally not so interested in sportives these days, but they can be a good reason to meet old cycling friends who live in different parts of the country so thought I’d sign up. This will be the first time I’ve ridden 100 miles in about 2 years so I’m looking forward to the challenge. 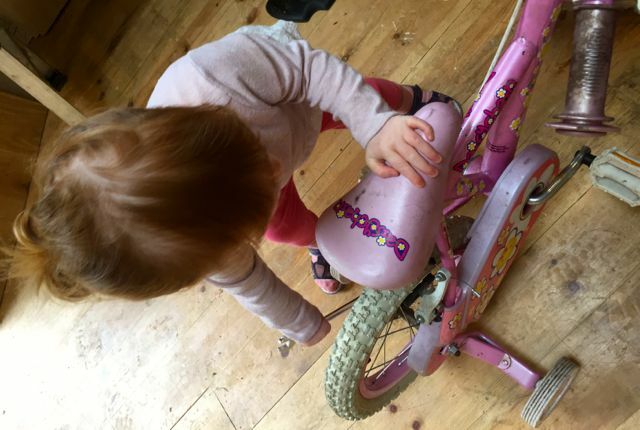 I was putting my bike back in the shed with my toddler daughter when she spotted the bike she’ll hopefully be learning to ride on one day. 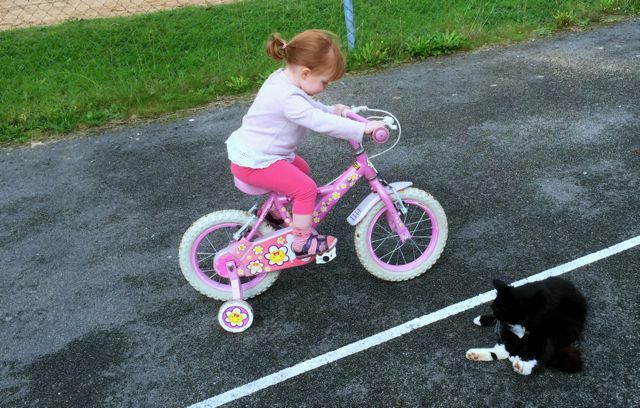 She seemed pretty keen to have a go but couldn’t reach the pedals yet. I think I’ve still got a few months before I need to fit the stabilisers. 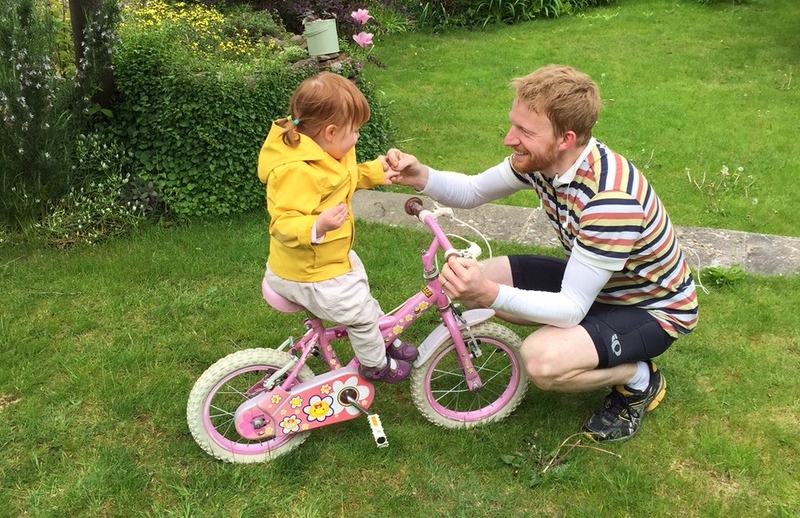 She seemed very adroit at eating a biscuit while sat on the bike – a key still for long distance cycling!